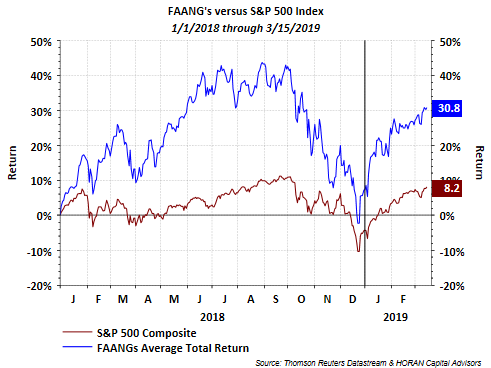 Since the equity market peak in the third quarter of 2018, the average return of the FAANG basket of stocks, i.e., Facebook (FB), Amazon (AMZN), Apple (AAPL), Netflix (NFLX) and Alphabet f/k/a Google (GOOGL), has underperformed the broader S&P 500 Index as seen below. I have highlighted the significant contribution the FAANG's have had to overall market returns in prior posts like the Growth verses Value article in 2017. 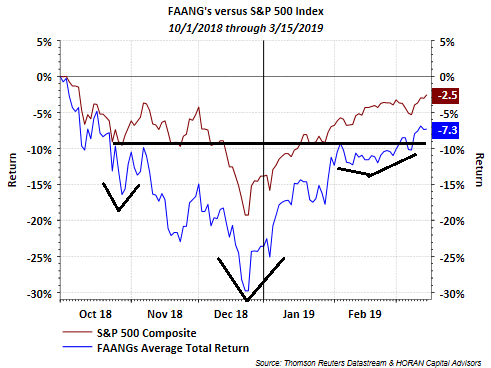 With the FAANG's return to the upside since the start of this year, the basket has resumed its outperformance and broken out of an inverse head and shoulders chart pattern (h/t: The Kirk Report). In spite of the FAANG's underperformance since the beginning of Q4 2018, the basket's return since the start of 2018 has been strong, yet more volatile than the broader market. If improved performance of the FAANG's is maintained, this would provide some tailwind to the overall S&P 500 Index returns as all but Netflix are top ten market capitalization weightings in the S&P 500 Index itself.